By: David Foskett, et al. Over 600 reliable recipes and 1,000 photographs cover the latest preparation, cooking and finishing techniques as well as the classics every chef should master. 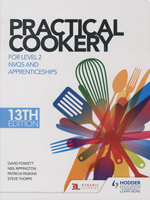 Fully updated, this book for Level 2 NVQ Diploma in Professional Cookery or Food Production and Cooking students also covers all of the essential underpinning knowledge for NVQs and the Hospitality and Catering Principles Technical Certificate for apprentices.